Hey, look! I’m actually writing stuff on my blog! With all the frustration and time spent over the transition to the new server and still not getting all of the podcast stuff straightened out (I have no foggy clue how to get the feed updated at iTunes, for instance), I’ve been a little disconnected from actually doing what the whole point of the site is. You know, actually writing, talking about, and generally discussing games. Hopefully, I’m turning the corner and will correct that going forward, getting started now with returning to my regularly-scheduled game night reports! For a couple of years, I basically ignored Netunner. I played one game with Chris Ingersoll when it first came out, but resisted the urge to buy into it, mostly because what I knew would happen if I made that first step. Over the last 2 or 3 months, though, I was “ready” to make that plunge, and it’s been pretty exhilarating. Coming to the game with all of my experience both with CCG’s (Magic, mostly) and now with modern boardgames, I feel like I really had the tools and capability to jump right in and hit the ground running. I’ve now caught up with all of the card pool (which wasn’t as expensive as you might think), have a decent enough handle on the current metagame of popular decks, and have a good working knowledge of most cards that see regular play. Plus, I read a few websites about Netrunner regularly, and I’ve subscribed to pretty much all of the current Netrunner podcasts. And like I said, it’s been a really cool experience to ride this steep learning curve up into a game like Netrunner! I enjoy general boardgaming a ton, but if there’s anything really missing from it for me, it’s this ability to “dive deeply” into a game; where your thoughts are regularly occupied with new things you can try and you’re challenged by new things you can learn. And unlike pretty much unlike any other constructible game like this that I’ve been into before, I’m really amazed at how well balanced Fantasy Flight has molded the metagame to be. If you look at factions and decklists from what’s been winning Regionals and other recent tournament events, there is a huge variety of competitive decks out there right now. Now, I could go on and on about Netrunner, but I’ll cut myself off here and pick up again when I do my full review in my eventual next podcast episode. And as I said before, I’d love to know how much interest all of you out there have in the game and if you’d be interested in more (or less, I suppose) detail about what I’m playing and how individual plays run. This was my second play of Concordia, but it was the first for new friends Rob and John. As we got started, Rob and I sort of headed off in the same basic direction and therefore benefited from shared production many times when either of us would use the Prefect action to generate goods in the regions we both occupied. John sort of headed off in another direction initially, and I feel like it set him behind a little to start. Based on some cards that I saw in the display, I decided to focus a lot on accumulating cards that featured the god Mars, which all score based on how many colonists you have. So one of my main foci of the game was to make sure that I got all 6 of mine into play. In doing so, however, I hit one point in the game where I was buying new cards and putting off my “refresh” for a number of turns. Now, normally, this is a pretty good idea, because it lets you be more efficient in taking less “wasted” turns of using the Tribune card, and it also gets you more money when you finally do so. But what happened to me is that since I was fiddling around with buying cards and playing things that got me more colonists but didn’t actually improve my board position or get me more resources, I felt like I fell behind a little bit. This game is a pretty cool balance between working on the here and now in developing your infrastructure (through using the Architect cards to move colonists and build colonies, the Prefect to gather resources from your colonies, or the Mercator to buy and/or sell goods) and looking towards the future in picking up more cards (using the Senator or Consul). The normal mistake (even in this game, where I made sure to warn them pretty strongly) is definitely to be all about the business of “playing the game” and forgetting to buy cards to actually score points at the end. But while I still won this game (just barely), I feel like I was definitely riding the line of going too far in the other direction and missing out on developing my position to take good enough advantage of the cards I had accumulated. I’ve really enjoyed my plays of Concordia so far. I don’t know if it’s going to have a ton of depth and replayability in the long run, but I don’t feel at all like I’m approaching its limit yet. So I’m very much looking forward to exploring it further! I’m a pretty big fan of Sentinels of the Multiverse, even though I don’t play it nearly as much as I should/would like to (especially considering that I continue to buy all of its expansions). But my friend Chris is an even bigger fan of Sentinels, and jumped right on board with one of Greater Than Games’ more recent Kickstarter games, Galactic Strike Force. It’s a cooperative game of trying to defend the galaxy from a number of different big, bad threats, where you sort of do a little bit of deckbuilding to buff up your individual spaceships, fending off evil minions until you’re ready to take on the huge flagship to either win or lose the game. As with Sentinels, you have a number of enemies to face in Galactic Strike Force, so we went with the Omega Singularity, which is sort of a hive-mind, Borg-like race of robotic ships programmed to absorb all military technology and destroy all civilization. The ship I chose was the Kharachar’s Claw, which has the cool shtick of being able to impressively ram opponents into oblivion. Chris chose the Marot’s Folly, which is a converted racing frigate, and Darren took the Vigilance, a well-balanced ship that can do a little bit of everything. The basic gameplay centers around moving your ships between three different sectors of space, buying equipment and tactics from the cards available there, using cards from you hand to buff up your ship or do cool things, and then fighting against the enemy ships that are there. If enemies are left unengaged, they damage the system by turning over cards from the piles there, which have bad effects on their flipsides that may create new enemies or do other annoying and/or hurtful things. The ships have their own smallish starter decks with unique cards giving neat and thematic abilities to each. A lot of what my ship-specific cards did was to move my ship around between sectors, often pulling other ships with me, and then giving me the ability to ram and destroy them completely if my attack power was greater than their shield value. Like a lot of coops, the main thing we were doing was to keep beating back the building threats of the minions while we built ourselves up enough to face their flagship. But by the time it was triggered to appear, Darren’s ship was so ridiculously huge that it really didn’t stand a chance. The first turn of combat all but destroyed it, and Darren cleaned up the remainder on the next turn to give us the win. I enjoyed playing Galactic Strike Force, but it didn’t really “wow” me the way that Sentinels of the Multiverse did right from the start. It’s pretty thematic, I guess, but it’s also incredibly fiddly with all the tokens and cards and 5 phases to each turn and all. And while I really like the little starting deck of cards that each ship has to give it its own flavor, by the end of the game, most of your real power is going to come from the generic cards bought from each sector, which anyone could pick up. There’s definitely some real tactical decision-making and cooperative role-filling going on, but it also felt a little bit “lather, rinse, repeat” by the end of the game. In some prior plays, Chris had games that went on much longer than this one did. Now, I was pretty happy with the length of this play, but it was at least beginning to wear out its welcome by this point, so I can see that it would pretty quickly approach painful monotony as it would approach the 2-hour mark or later. And therefore, I can’t see that pushing the player count much above 3 (and certainly not up to the 6-player cap on the box) would be a good idea at all. While I’d gladly play it again sometime, I’m also not exactly chomping at the bit to do so. However, I do have some interest in picking up the game mostly because I wonder if it would make for a good solo experience, even if you did have to play 2 ships to do so. One of the games I had asked for and received for my birthday was Legacy: The Testament of Duke de Crecy. I don’t know exactly why, but the whole theme of being a French noble in the 18th century trying to orchestrate your family’s legacy for the next 3-4 generations sounded really cool to me. At the start, everyone gets a Patriarch/Matriarch card and gets to decide which side to use. They’re similar, but have slightly different values of starting money vs. continuing income. In each turn, then, you take actions using what is basically a worker-placement mechanic to get married, have children, marry off your children, buy mansions, throw parties, and do all kinds of other things that French nobles in the 18th century apparently did. The game is played over 9 rounds, which are divided into the three generations (2 rounds in the 1st, 3 in the 2nd, and 4 in the 4th), during which your focus shift further down your family tree. You have money as one resource and a hand of Friend cards as another. Friend cards are played to create a marriage for one of your blood descendants (or yourself at the beginning of the game), but are also used to pay for certain other actions that you can take. Any time you get someone married, they have a child, and you can also take other actions to give them more children later on. Any time a child is born, you draw from a deck of child cards, which can obviously be either a boy or a girl, but may also result in a complication that costs the life of either the child or the mother. And on top of that direct family-building, you can also do a number of other things to increase your prestige, income, or directly score you points. In our game, John definitely jumped way ahead of everyone else when he actually took his eye off of building his family a little and started completing the “Contributions to the Community” and getting Titles that gave him lots of points. Some of us caught up a little when our family and end-game “secret mission” points were scored, but it wasn’t nearly enough to catch up with him. I definitely had a good time with Legacy, but I also enjoyed it significantly more than anyone else. Just being able to see this growing family tree right there in front of you is really cool for me. And while the reality of life in pre- and revolutionary France probably wasn’t all that fun a lot of times, this game takes a really light-hearted approach to the whole theme. The pictures on the Friend cards alone are pretty hilarious, especially when you have to look more than once to figure out if s character is a man or a woman… and then you go ahead and choose to marry her yourself because you like her ability (as I did). But on the other hand, that same cool family tree also becomes pretty huge and unwieldy by the end of the game. And nearly 100 minutes is way longer than this game should be. Now, I think that a lot of that was just the fact that none of us had played before and didn’t really know what to do, so I hope it will be a lot closer to the 60 minutes promised on the box in future plays, but a little longer would still hold me interest pretty well. If there’s a real flaw in the game, though, I’d say that it comes in how programmed your first couple of turns are. Obviously, in order to have any sort of decent family tree, you are going to have to dedicate at least 2 or 3 of your 4 core actions in the first generation to getting married and having children. That only leaves you 1 or 2 actions to do anything that might differentiate you from your opponents and start actually working on a larger strategy. And while each character also comes with one “extra action” discs, they are all color-coded to a particular action and can only be used to do that thing, which again is not giving players a lot of choice. I’d say that it would probably be a big improvement to the early game to allow players to get married and have that first child before the first turn even begins. Maybe have players draw one extra card in their initial hand, choose a partner for themselves, and play it (paying all costs and getting all benefits as normal) before the game gets started. And I’d also say that any complications drawn for the initial child would probably be discarded as well, just to make sure everyone is on more or less even footing. The only problem with this is if a player didn’t get any suitable Friend cards to marry, they wouldn’t have the chance to draw more cards before taking the action (as they could do in the rules as written), but maybe you could even give the option for a “Mulligan” to get a new hand if the first didn’t look good. I don’t have all this completely worked out, but I do know that I certainly enjoy the game, and would love to help others enjoy it too. I don’t have much to say about Fidelitas right yet, other than it’s a light little puzzly filler card game from Jason Kotarski (designer of The Great Heartland Hauling Co.) and Philip duBarry (designer of Revolution and Kingdom of Solomon) that will be hitting Kickstarter in August from Jason’s brand-new publishing company, Green Couch Games. The basic idea is that you have these 5 locations that line up with 5 of the guilds in the city. You’re trying to play cards to these locations to meet the requirements on secret mission cards you’ve drawn (such as having characters from 6 different guilds at the Commerce location). When you play a character card to a location, though, it also gives you some little effect to move cards around as well, so there’s lots of little tactical things you can do. In my first game (played with the long-lost Tom), I ran away with it. I don’t know if it was just bad luck or if he wasn’t seeing something that he needed to be doing, but I won before he scored a single mission card. This was just my first play, and it was sort of squeezed in as we were waiting on Kenny and Britt to finish a game of Warmachine, so I hate to give much of an opinion quite yet. Stay tuned, though, because I’ll definitely talk a lot more about it as the Kickstarter gets closer! The big event at our last game night, however, was not a boardgame at all. Britt is starting a new job soon and won’t be available to come over from Raleigh much, so we wanted to get in a roleplaying session with him instead. 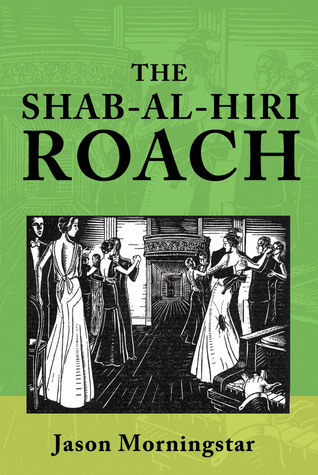 We’ve played a lot of Fiasco before, but this time, we decided to go with designer Jason Morningstar’s older (and even darker) GM-less game, The Shab Al-Hiri Roach. What’s sort of cool is that for the first half of the game, no one was actually controlled by the roach, so our scenes and conflicts were pretty mundane and all about petty personal and academic stuff. But then, during the 4th event, things got kicked up a notch when I and Tom became slaves to the little demon. I then proceeded to force-feed it to our star quarterback before the Homecoming game, and he ended up killing an opposing player at the start of the 2nd half. Unfortunately, just as it was about to go all gonzo and get crazy, we ran out of time. Hopefully, though, we’ll be able to finish up this game and do some other cool roleplaying in the near future. I really like The Shab Al-Hiri Roach. It’s so totally a non-traditional, “storygame” RPG, which I know isn’t everyone’s cup of tea. But if you’re willing to open your mind a little bit to the mechanical parts of the game and let yourself be creative in this horribly dark comedic setting, it’s pretty awesome. Mostly, I like how the players get to totally decide what the tone and theme of play will be. I’ve heard of games that never got more crazy than a dirty scheme to become department chair, while most of my plays have been more along the lines of ending when the University literally exploded. But, amazingly, I think that actually catches me up on what I’ve been playing at game night recently. Of course, today is Tuesday, so more games are waiting for me soon! Game 1: Keith ?, Kenny ? I wanted to note that the Agricola game recorded was the cardless “family game” since John had never played before and I thought that would be the easier teaching version (and a better segue into Caverna at a later point). What I (and Stacy and Ken) failed to consider was that the family game is hard, as reflected by the scores.